Somewhere between Halloween and Thanksgiving, fall happens for me. The aroma of apples and cinnamon gives me that nostalgic buzz, which turns into a solid month of pumpkin-y, spicy, apple-y, and caramel-y goodness. This is where I draw inspiration. 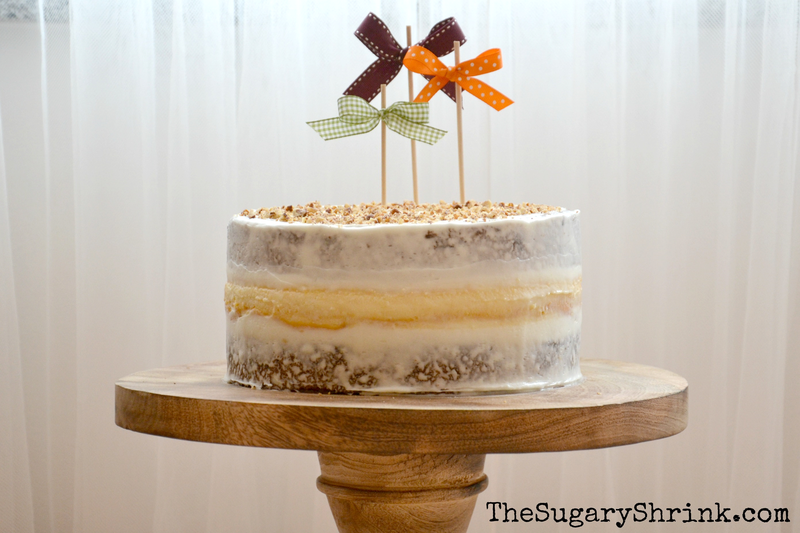 This is a cinnamon cake with vanilla buttercream and a thin layer of apple-pie filling. It is encased in tinted vanilla buttercream roses. While this might sound complicated for a home baker, it's fairly simple. I baked three round layers of cinnamon cake. I made my own apple-pie filling with additional caramel sauce. Then, I whipped up some vanilla buttercream. I have time to bake from scratch, but this recipe is absolutely doable if choosing any or all components from a box mix or ready-to-use. If piping the roses isn't in the cards, a smooth crumb-coat or rustic swirls would be a great alternative. Ideally, baking should be creative and enjoyable and less a chore. Give yourself permission to experiment with colors. 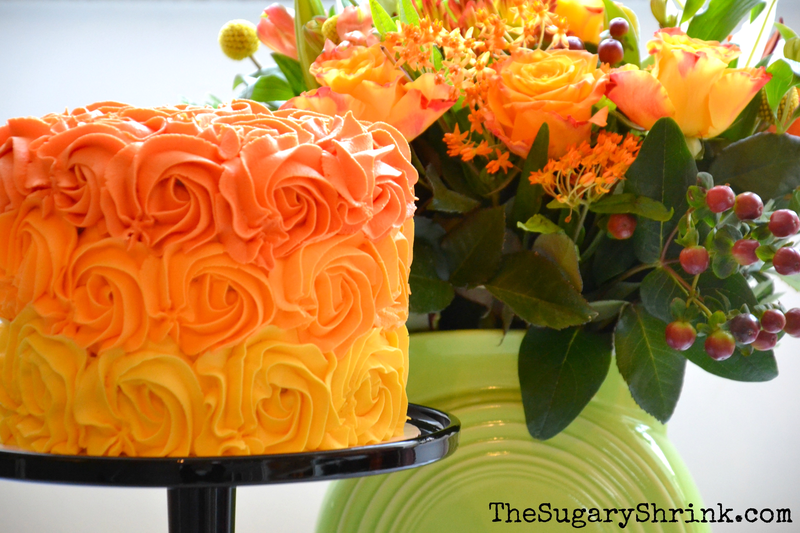 This cake design was inspired by this gorgeous bouquet. I didn't wake up one morning thinking about this cake, but when I was given these flowers I knew it was a cake! If using pre-made tub frosting, whip in powdered sugar for added stiffness. This will support additional layers and hold shape if piping the roses. If building this cake with jams, jellies, etc., dowel the center of the cake with something sturdy, such as a bubble tea straw or wooden dowel suitable for use in food. 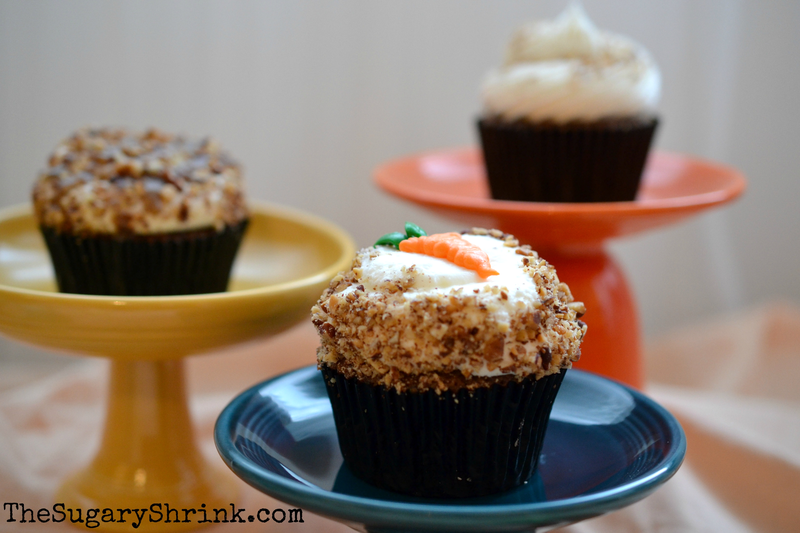 These carrot cake cupcakes are deliciously moist — they're one of my favorites! — and are topped with salted caramel drizzled over vanilla buttercream. I'd made a batch of salted caramel sauce a few days before for a different project — this sauce will last several weeks in the fridge if stored in a jar with a tight lid. As I was making the buttercream, I added a few tablespoons of caramel sauce; the results were droolworthy! The little waffle wedge is part of a much larger packaged waffle treat that I found at Starbucks. 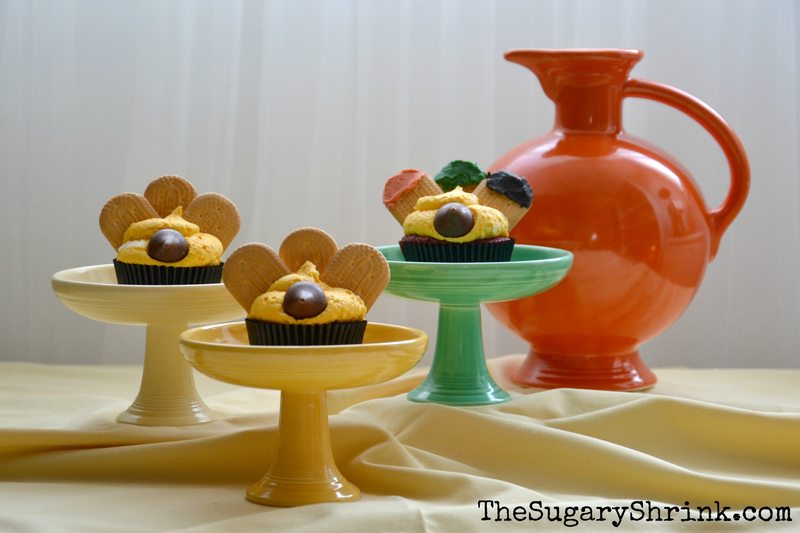 To dress up a cupcake, I look for a simple way to elevate the look. In this case, piping on the frosting, plopping on a store-bought waffle slice and adding drizzle achieves that "turn-up-the-volume" look. This is the same scrumptious carrot cake frosted with cream cheese buttercream, garnished with toasted walnuts and a little piped on carrot. Cupcake design offers limitless possibilities. I frosted each cupcake with a basic cream cheese buttercream. Then, I unleashed the Design Kraken! 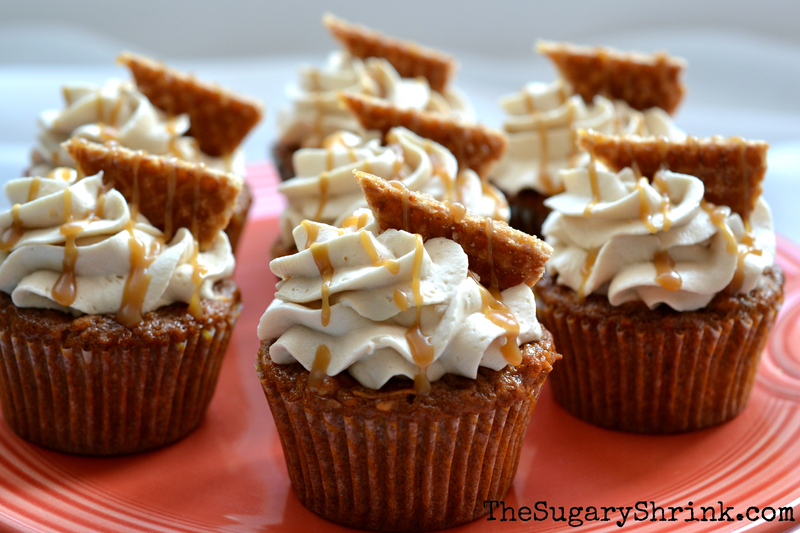 Some cupcakes have toasted walnuts, others have caramel and there are a few with both. Be sure to switch up the piping tips to determine which look is best. I gave myself permission to experiment with color and design. The carrot is piped on with a very small open-round tip (in this case, Wilton 4) by using a back-and-forth pattern starting at the widest part of the carrot and narrowing down. A few green bits of frosting finish the look. Most importantly, the carrot doesn't detract from the overall taste experience and adds to the visual appeal. 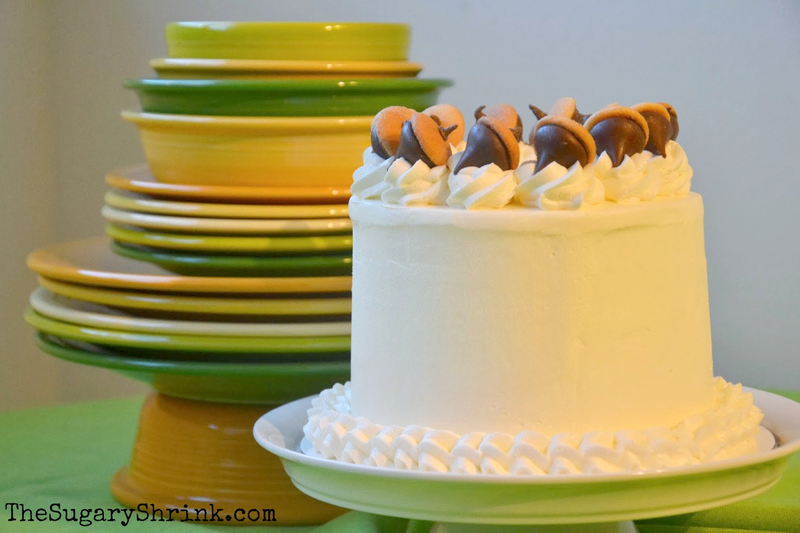 Before trying a new piping technique on a cake, I practice piping the buttercream on a plate. I can scoop these efforts back into the frosting bowl and feel good that I'm not wasting the ingredients. 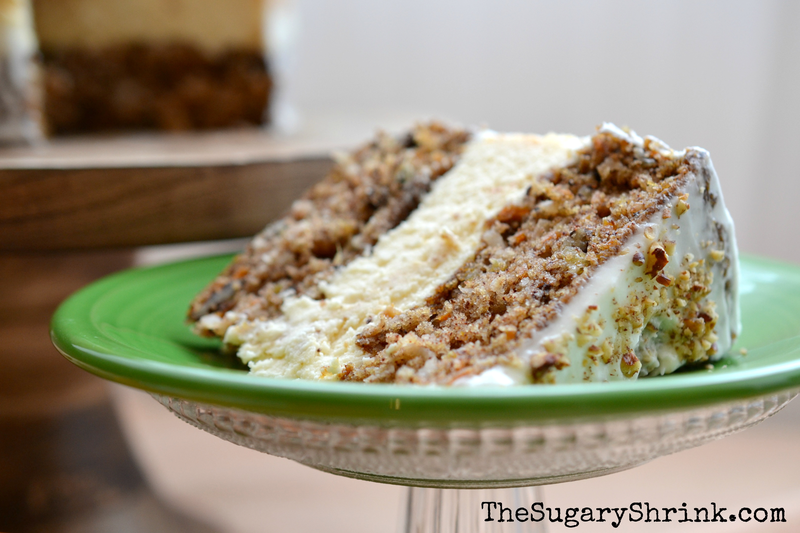 Carrot cake + cheesecake = delicious! 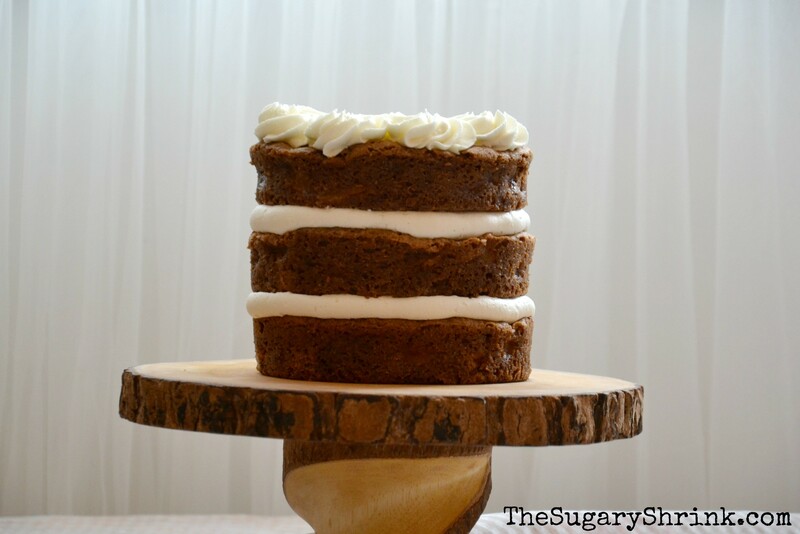 A carrot cake with a cheesecake layer is almost always a crowd-pleaser. My tried and true carrot cake recipe serves as the bottom and top layer while a crustless cheesecake takes center stage. No buttercream is needed between layers during the build. 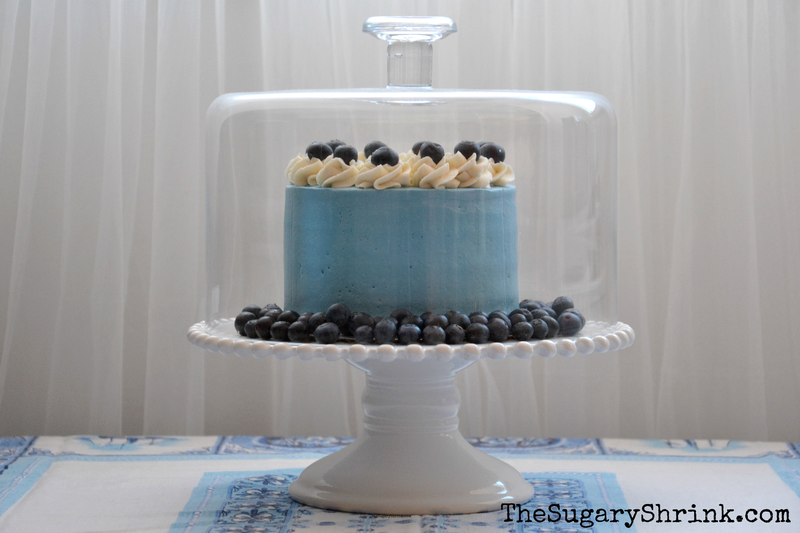 Cake decorating doesn't have to be complicated. Give yourself permission to use whatever you like or clear out some of the flotsam and jetsam from your craft bin. 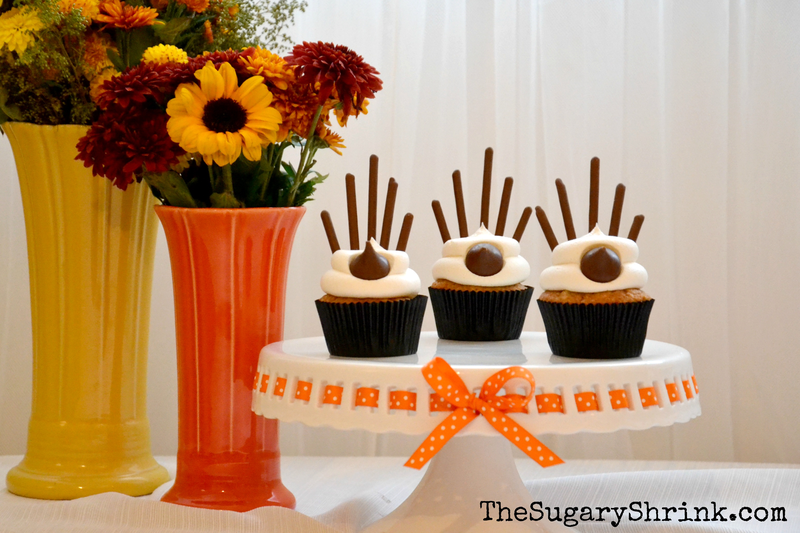 These toppers were created from what I pulled out of the craft cabinet: three kabob skewers and fall-colored ribbons. Do yourself a favor and take the time to toast the walnuts or pecans destined for the garnish. After 7–8 minutes in a 350-degree oven, the chopping process releases a wonderful aroma, enhances flavors and adds to the experience. 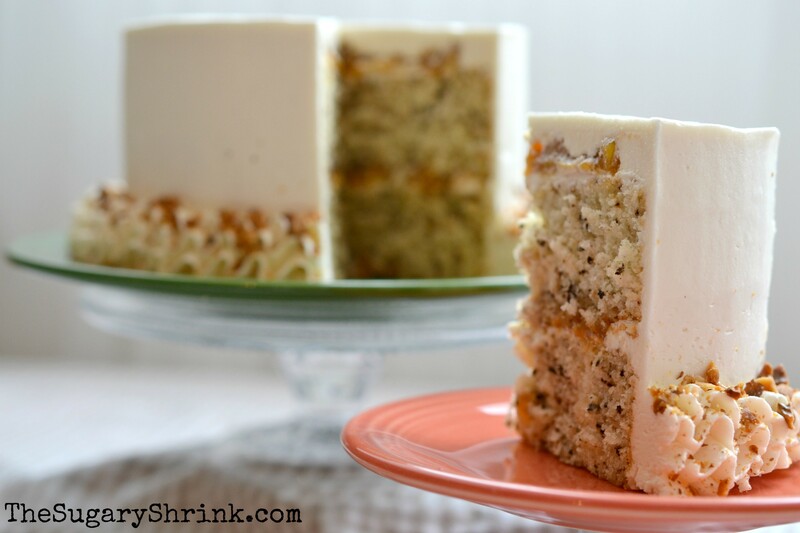 When slicing a cake, such as this carrot cake with a cheesecake layer, there are several tips and techniques I've learned since I started baking like a woman possessed. If the cake has been in the fridge until just before serving, warm the knife up with hot water. It isn't exactly hot-knife-through-butter, but it will cut a nice clean slice. As inconvenient as it might be, clean the knife in hot water, either in the sink or in a pitcher or tall glass of hot water at the table, before slicing each piece. If the cake has been sitting out, it isn't necessary to begin with a heated knife. But be prepared with water and paper towels or napkins to wipe down the knife between slices. When the cake or filling has delicious chunks of fruit, nuts, raisins, etc., use a serrated blade with a very slight sawing motion once the knife reaches the spongy part of the cake. Don't worry — the cake won't break. Inspiration for cake comes from anywhere! 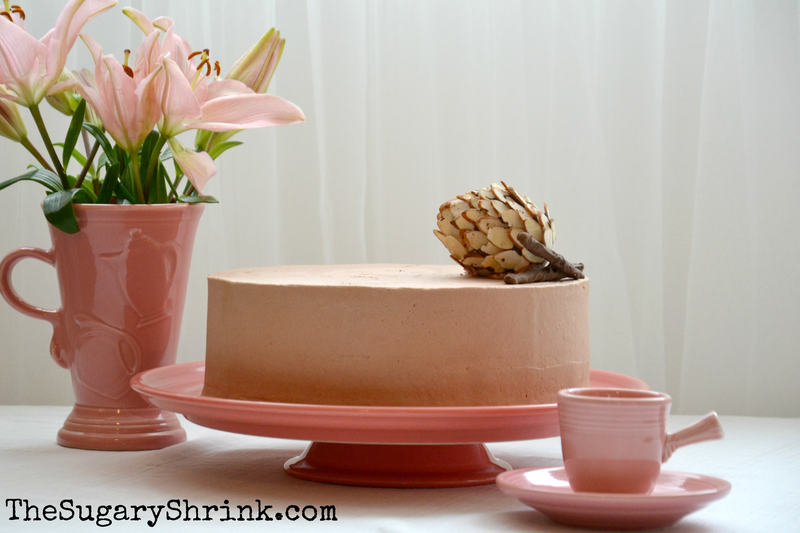 This cake was indeed an homage to seasonal changes and the abundance of pinecones. In trying to figure out how to go from idea to execution, I sometimes take a quick peek online to see who has already invented the wheel. The pinecone perched on this cake is made from a chocolate Kinder egg and almond slices; the sticks are pretzels dipped in dark chocolate. It is an adaptation of a cheeseball that uses whole almonds to mimic a pinecone. As a home baker, I typically use what's easily available and handy. Launching from the almond pinecone, I decided on a double-layer almond cake, but was stumped on filling and frosting. Looking in the pantry, I found an open jar of Nutella. It was a winning combination! The simplicity of this apple cake with vanilla buttercream is perfect this time of year and the "acorns" help elevate this little beauty to the dessert table. The adorable little nuts are created from a Hershey’s Kiss and a mini-Nilla wafer. Using a dab of dark buttercream for the "glue," press the kiss into the cookie and then pipe a little stem on the outside center of the mini-Nilla. If mini-Nilla wafers aren't available, just take a look around the store for a suitable substitute. Look for something sweet and crunchy that will pair with chocolate, for example a mini Nutter Butter Bite can be twisted apart and stuck onto a Kiss. Maybe even consider baking a small biscotti, mini-ginger snaps, peanut butter cookies, etc. Baking is an approachable art — participate at your own level of energy, creativity and doability. Tip: These simple acorns make for a wonderful addition to a tidbit tray with other chocolates or cookies. Present them in candy-sized cupcake liners for added appeal. Walnuts and blueberries, oh my! If it's good enough to put on my oatmeal, it's perfect for a cake. That's exactly how this cake happened. The everyday aspects of life can be interpreted through a variety of artistic mediums, e.g. buttercream, fabric, watercolors, the written word, etc. Creativity is a key for balanced living. In the case of this walnut cake, I began with my vanilla cake recipe and added one cup of chopped walnuts. Consider recipes as guidelines and give yourself permission to experiment with adding or omitting ingredients. Caution! While some things can be altered without significantly changing the outcome, when adjusting the leavening agents of baking soda and baking powder, the results may be altered significantly. This rustic cake will almost certainly be a highlight on my own Thanksgiving table. The colors of the tinted cream cheese buttercream were inspired by the explosion of color that happened on the hillside across the river from my apartment. It was gorgeous! Much of what motivates my baking are the endless combinations of flavors, textures and colors that continually inspire me. 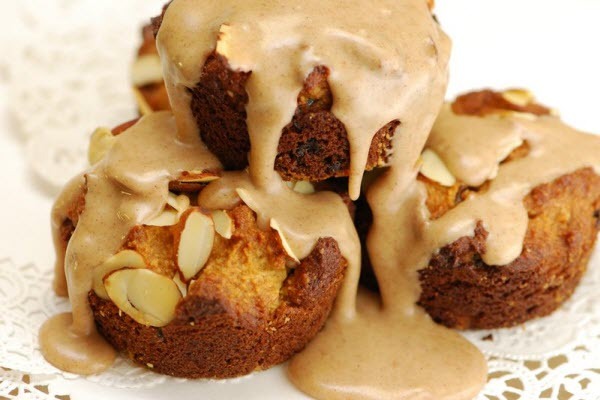 What's fall without pumpkin flavored treats? 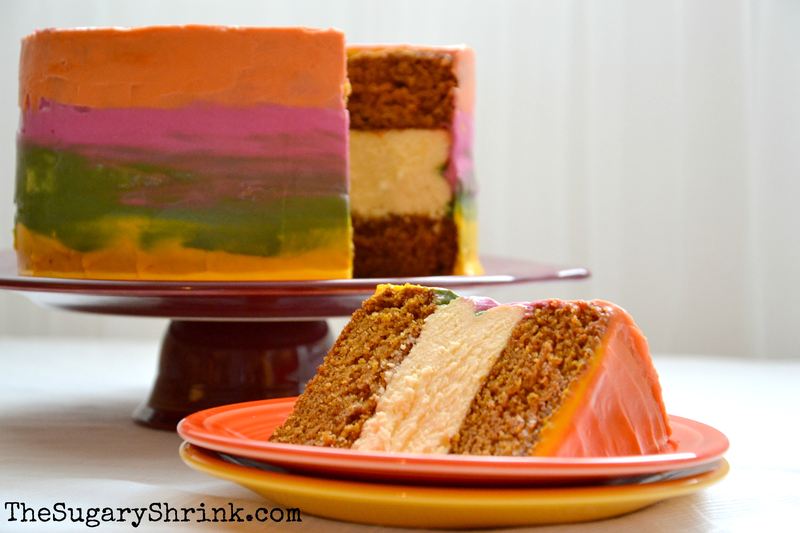 This pumpkin cake with a cheesecake layer and a frosting of tinted cream cheese buttercream tasted as heavenly as it sounds (if you like pumpkin and cheesecake). The texture of the pumpkin cake paired brilliantly with the cheesecake. Consider a cake like this as an alternative to pie or an addition to your Thanksgiving dessert options. Can you already hear, "Oh, I can't have a whole slice, just give me a sliver... of everything." Keep this beauty in the fridge until about 15–20 minutes before serving. The cheesecake holds up better and the cake will slice beautifully. Don't like cheesecake? 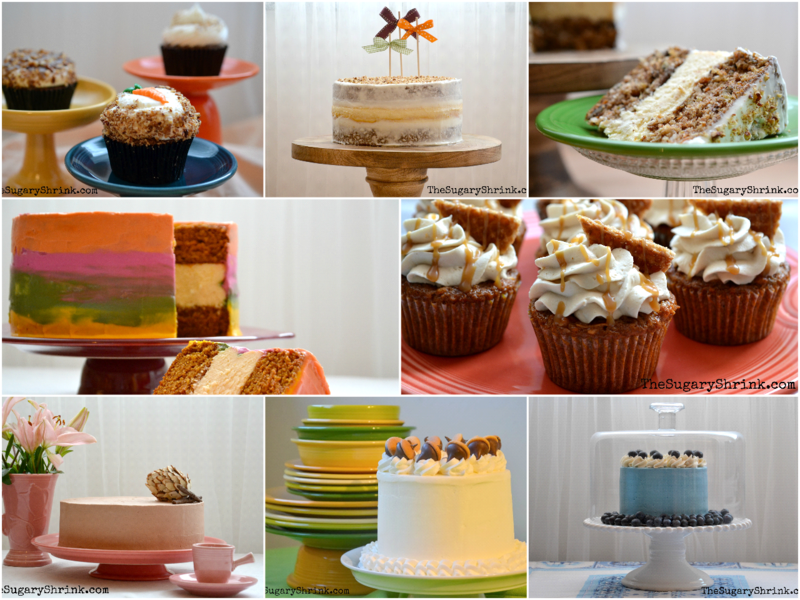 Consider adding a layer of cake that pairs well with pumpkin, such as pecan, vanilla, maple, or carrot cake. What's Thanksgiving without a turkey (or Tofurkey)? These sweet little turkeys couldn't have been easier! Add a swirl of buttercream. Use straight-from-the-package Pocky sticks. No Pocky sticks near you? Consider using pretzel sticks, with or without a chocolate coating. For a crisp look, lay the sticks out parallel to each other, align in a chevron pattern, and trim the bottom edges even. An unwrapped Hershey's Kiss front and center completes this look. Going to a Game of Thrones party? This design will have you covered. 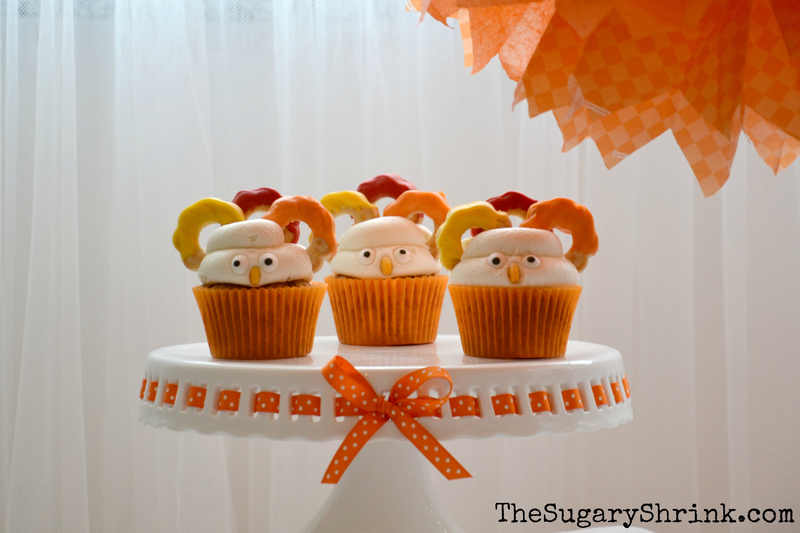 Here is another take on the turkey cupcakes. Make cupcakes with a buttercream swirl. Add three butter cookies, a pair of candy googly eyes and the tip of a candy corn for the beak. I chose to dip some of the cookies in Wilton Candy Melts. You can skip this step if preferred. For a fun activity, have the kids to help build these cuties for the party. Your guests will love having double dessert — cookies and a cupcake! Don't be shy about the amount of buttercream on this cupcake. The buttercream that supports the cookies serves as a dip for the cookies. Here is the final entry in the "What is this turkey doing on my dessert plate?!" contest. Again, keep cupcake decorations simple and approachable. All you need is a cupcake, a swirl of buttercream and a few Vienna Finger cream sandwich cookies. Carefully twist apart the sandwich cookies, cut each in two and gently press three halves toward the back of the cupcake in a two-in-front-one-behind pattern. Eat the fourth cookie half as a reward! The unwrapped Hershey's kiss serves as a wonderful finishing component. Or, consider using up the last of the candy googly eyes. If you have leftover buttercream, candy melts, or chocolate that needs to get used up, dip the curved end of the cookies in the medium to add some flair. 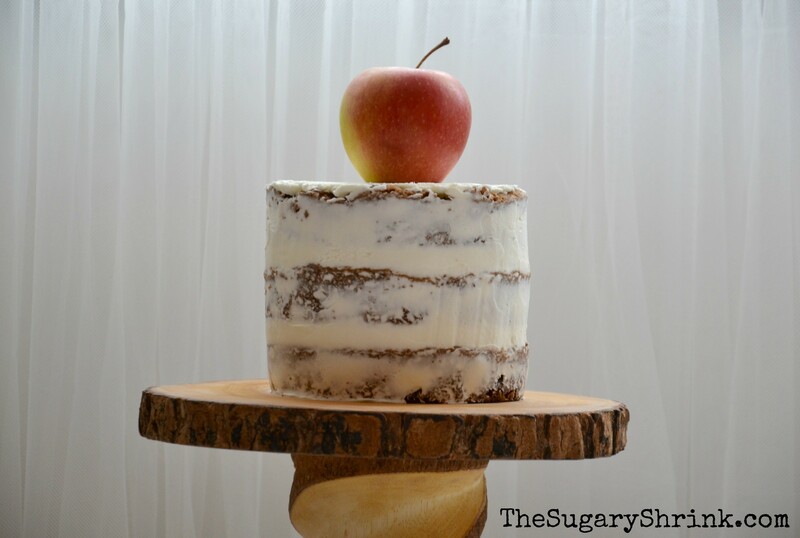 Apple cake with vanilla buttercream — it’s so simple and delicious! Cake doesn’t have to be complicated to be elegant. I love this “naked” design! And, I have noticed that cake stands often contribute to the overall effect of a cake presentation. This tree stump cake stand, when used judiciously, makes for a fantastic “wow!” moment. 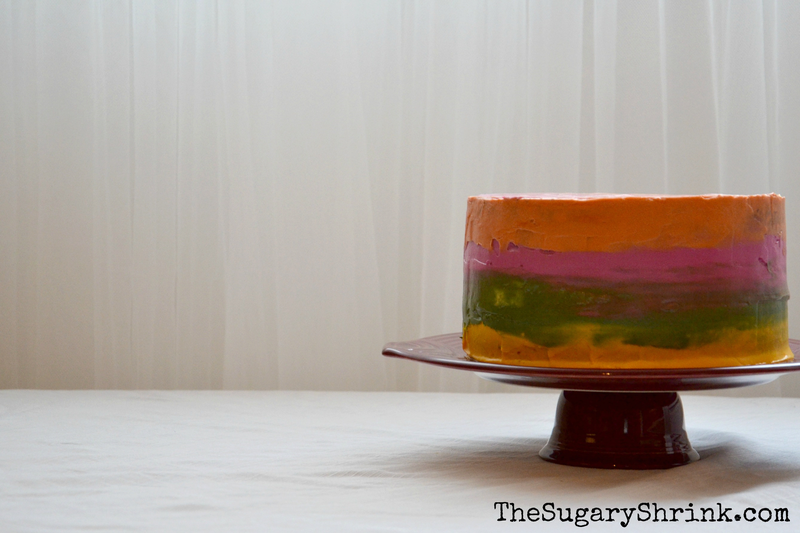 With an exposed cake design like this one, it’s very important that the layers be even. Weigh each cake round and ensure equal portions before baking. Measure the cake batter before pouring into each pan. Level each layer to the same height. More tips on even layers can be found here. This is the exact same apple cake as on the previous page, but with a crumb coat of vanilla buttercream. This look is both simple and interesting. As soon as I plopped a whole apple on top of this cake, I stopped trying new ideas because it just seemed so right. I can’t say why it works or what about the apple resonates, I just know that I like it. In art and in life, that can often be the case. Here is a traditional and final look for our apple cake with vanilla buttercream in which toasted pecans and caramel sauce were added. Talk about scrumptious! There is no doubt that that the layering of flavors and textures in this dessert is well worth the effort. If there are leftovers of this cake, it will maintain its shape and quality if stored in the refrigerator overnight. Each iteration of this cake was complete in itself, which reflects my attitude as a home baker: There is no right or wrong in cake, cake design or finished product. When baking a new cake recipe, I try to spare a small amount of batter for a cupcake so I can experiment with it in both forms. This walnut cake was first paired successfully with blueberries so I decided to try it again with a caramelized apple pie filling. I didn’t have a recipe, so I put all the traditional apple pie filling ingredients in a sauce pan then added some of the same ingredients used for caramel sauce. The result was the filling for this surprisingly light cake. Tip: To increase the flavor experience for the cupcake cousin of this cake, core out the center and fill with the Apple Pie Filling. It’s like have an exact slice of this on-the-go! 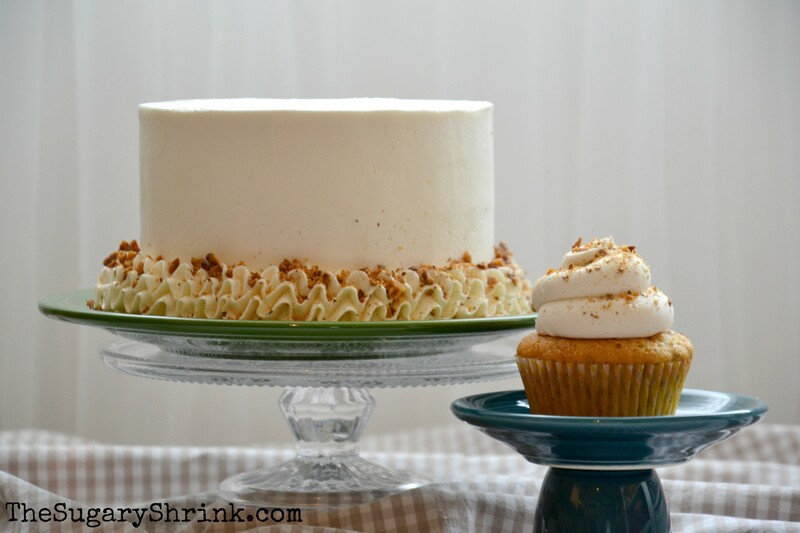 Vanilla buttercream was a wonderful addition to the walnuts and apples. Maybe next time I’ll try maple buttercream or cinnamon buttercream or maybe even salted caramel buttercream. Baking offers so many opportunities to combine sweet with savory, smooth with crunchy, and knowns with surprises. I thrive on the creativity baking in my home kitchen provides. When adding filling to the uppermost layer of cake, pop the cake into the fridge before and after crumb coating the top of the cake. As the filling chills, it will be easier to apply the buttercream. This was my first attempt at something spectacular — 72 weeks ago. 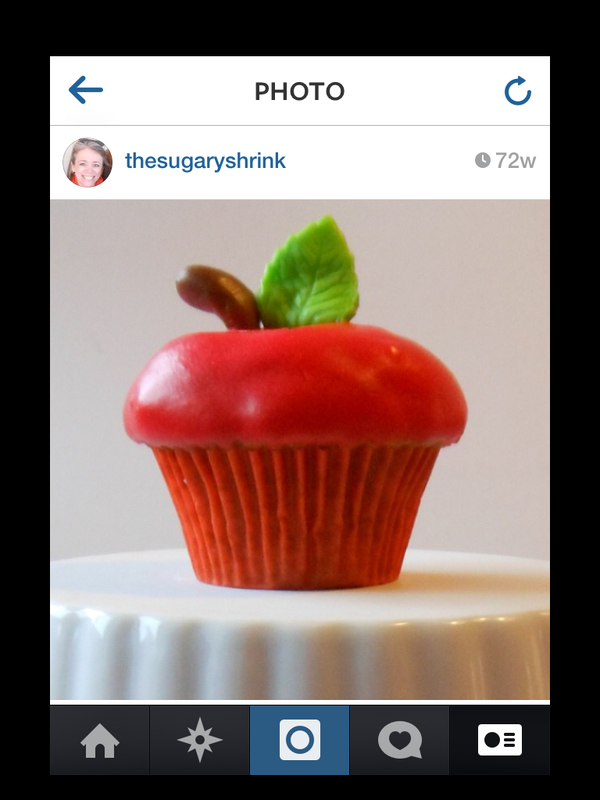 This is a mini apple cupcake and the difficulty level should have read: "Outrageous!" I like knowing that I remain willing to tackle the ridiculous because sometimes the results come out much better than expected. This apple stem was made from a Tootsie Roll and the accompanying leaf made possible by a green Starburst (rolled flat and cut with a rose leaf tool). Julia has been married to her life partner, John Murphy, for 27 years and together they’ve raised four kids into adulthood — which constitutes an epic parenting win! With a MA in Counseling Psychology plus academic publications, she’s worked primarily in addiction recovery; nevertheless, she’s currently living in Germany and baking cakes. 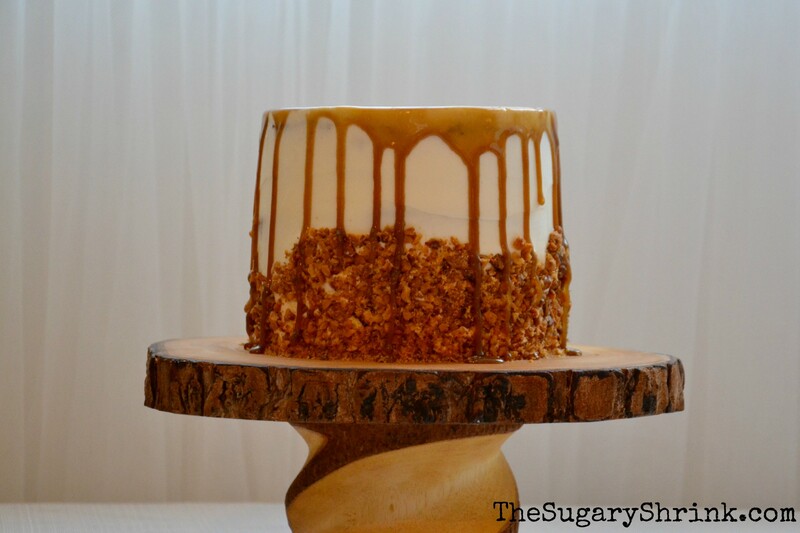 Despite The Sugary Shrink being a completely self-taught home baker, she was chosen Cake Designer of the Month, July 2014 by Cake & Bake Accessories, Paris, France. Look for her on Instagram, Facebook, and Twitter. Find her blog at www.thesugaryshrink.com.